The mimus polyglottos, as the mockingbird is known scientifically, is about ten inches in length, including its relatively long tail. It has a light gray coat and a whitish underside. Its wings and tail are darker gray with white patches. The song of the mockingbird is a medley of the calls of many other birds. Each imitation is repeated two or three times, then another song is started, all in rapid succession. In the above sample audio file, the songs of four distinct species were recorded in the span of about seven seconds. It is common for an individual bird to have as many as 25-30 songs in its repertory. 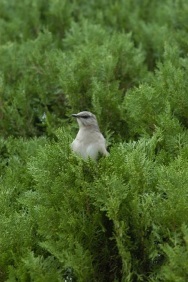 The mockingbird is also known as a fierce protector of its nest and environment. It is sometimes seen swooping down on a dog, cat or predator that may be venturing too close to the bird's protected territory. Ask any Texan, and you will no doubt learn that the mockingbird has the prettiest song of any bird native to North America. That's perhaps the chief reason the "mocker" was adopted as the state bird of Texas in 1927.